When I saw this prompt I couldn’t think what my favourite book is. In my time I’ve been an avid reader but other than last year*, recently I’ve not read much at all. The first book that came to mind was a Welsh book that we studied for Welsh GCSE – “Cysgod Y Cryman”. We studied this book at length and I’ve read it a few times since leaving school. In fact I’m tempted to read it again now that I’ve found my copy! The 2nd World War is over, but its consequences for the Vaughan family will be felt for years to come. The son, Harri, who has been a conscientious objector, returns and is engaged to the daughter of a nearby family. But change is inevitable. There is obviously more to the story and it is a good read. It’s been translated into English and is called “Shadow of the Sickle”. If you can read it, I would really recommend it. Like I said, I found my copy today and here’s some photos of it. I hadn’t realised it was a first edition before. Shame it’s missing it’s dust sleeve. When I went looking for this book I had a look on what else I have on the bookshelves. Here’s four of the shelves and as you can see I have a bit of an eclectic collection. Alan Titchmarsh – so he’s better known as a celebrity gardener but he also writes books. And they’re very entertaining. Biographies – Eddie Jordan, David Coulthard, Murray Walker (all F1 peeps!) and Michael Crawford, Johnny Cash and Gordon Ramsay – so far I’ve only read Michael Crawford’s one. Jackie Collins – I’ve read one book by her and they’re a bit err. “fruity” but enjoyable! Wendy Holden – I picked one up in a charity shop and read it on the bus last year. I’ve then gone on to read another 5 of her books with another 2 pending! They’re “chick-lit” and although they’re somewhat predictable they were still great. Dracula – I love Dracula the character and so I’m thinking I ought to read the actual book. Pregnancy For Men – this book I bought for the hubby when I was pregnant. It’s supposed to give men the pregnancy advice but in “men speak”. I must admit, I enjoyed it! It was fantastic!! What’s your favourite book? And have you got a mixed collection or do you stick to the same genre? 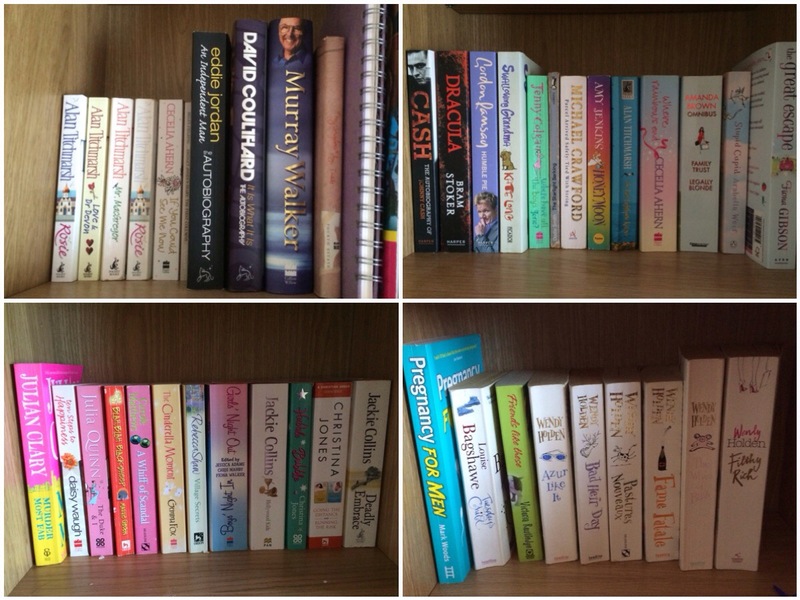 I could never pick a favourite book! There are far too many. And my collection is definitely mixed. I have a bit of everything – chick lit, classics, horror, fantasy, crime, teen books (except it’s called Young Adult these days ;-))… I could go on! The amount of books you read I can imagine you could never pick a favourite!! 🙂 I’ve not read any horror – not keen on the genre – but I feel compelled to try Dracula. Have yuo read it? I’ve found it a bit difficult to concentrate on.